You know how some comedies just don't seem funny without an audience. Welcome to "Along Came Polly" on video. Jennifer Aniston must have been struck with serious deja vu while filming one pivotal scene from "Along Came Polly," in which she discovers that a neurotic risk assessor (Ben Stiller) -- whom she's been seeing since his bride dumped him on their honeymoon -- has used his laptop computer to make a list of pros and cons about their relationship, hoping to analyze his way to Ms. Right. Almost the exact same circumstances once led to the breakup on "Friends" between her Rachel and David Schwimmer's neurotic, risk-averse Ross. It's just such a tendency toward the derivative that leaves "Along Came Polly" lacking any fresh romantic-comedy punch. A blind pet ferret that wreaks havoc on Stiller's attempted seductions smacks of the dog that did the same in "There's Something About Mary." A scene in which Stiller kisses up to his boss (Alec Baldwin) in the men's room recalls an awkward moment in "Brazil," and the urinal humor that drives the scene is straight out of "Austin Powers" (which was hardly the originator of such gags in the first place). Writer-director John Hamburg (who penned Stiller's "Zoolander" and "Meet the Parents") often sets up whole scenes for the sake of a single gross-out joke (during a pick-up game of basketball, Stiller does a slow-motion face-plant into the sweaty, hairy chest of an overweight opponent). Yet, he doesn't spend half that energy on developing what is actually a pretty fertile concept about an anally retentive guy who loosens up with the help of a free spirit after his life is turned upside-down. But even when Reuben and Polly's first date ends almost as badly as his honeymoon (with cheap laughs derived from his irritable bowl syndrome and her overflowing toilet), she still calls him for a second date, inexplicably enough. And as their fling progresses, Hamburg exploits their differences only in superficial ways, like the fact that Stiller is too much of a stiff to dance with her at a salsa club. The movie's best moments come not from Stiller's shopworn, wide-eyed, slow-motion mugging or from the sparkless attraction of opposites at its core, but courtesy of scene-stealers like Azaria and Baldwin (who's having a career Renaissance with a string of abundantly overbearing roles). In fact, Reuben's bad-advice-giving best friend -- a long-washed-up child actor clinging pathetically to his glory days -- is almost worthy of a movie unto himself, thanks to the incomparable Philip Seymour Hoffman ("The Talented Mr. Ripley," "Almost Famous," "Cold Mountain"). With a down-in-the-dumps hero whose livelihood depends on his anxieties, and a pretty romantic interest dragging the fellow kicking and screaming toward maverick bliss, it's a pity that Woody Allen couldn't have gotten his hands on "Along Came Polly" to lift it above its baser instincts and give it some insightful sophistication and wily wit. Unfortunately, Hamburg aims much lower and still misses his mark. 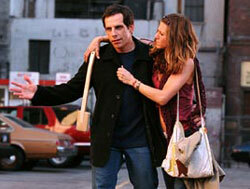 With a more deeply developed clashing romance, Stiller and Aniston might have held this film together. But while I suppose it's to Hamburg's credit that he didn't use the plot as an excuse for a string of "extreme" gimmick episodes (The risk assessor goes snowboarding! ), "Polly" is missing the polish needed to pull off anything more satisfying than a handful of easy guffaws.